First Workshop at Glastonbury Studios Grand Success! 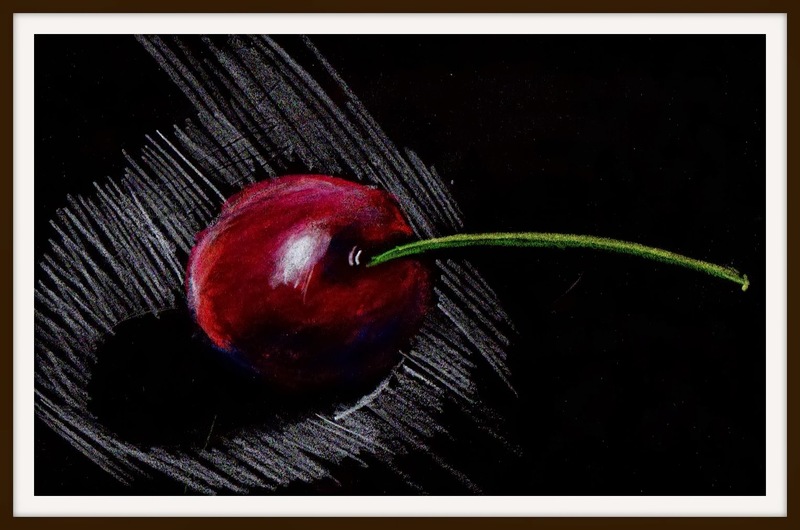 I just want to mention, before I get into the incredible story of Georges Seurat, that my first studio Colored Pencil Workshop, held in June, was a flying success. In total I had seven people--a perfect size, compared to the 15-18 student-size workshops I have taught in other locations. My goal is to create workshops that will be small in size, providing more intimacy in learning and one-to-one interaction. When studying artists, especially those who die young, I always wonder what he or she could have produced if given more time. Of the four post-impressionists we have studied so far, two were in their thirties when they died: Van Gogh (37) and Toulouse-Lautrec (36) And now, we see another great artist, Georges Seurat, whose life was cut short at 31. It just doesn't seem fair. 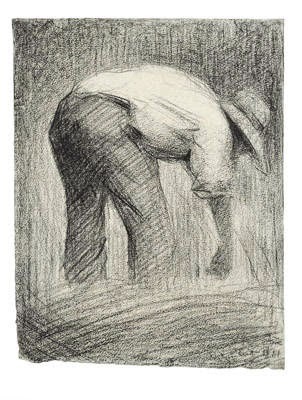 Coming from a privileged background, Seurat never had to worry about money. He received a monthly allowance of 400 francs while most workers were only making 150 francs. Born in Paris in 1859, Seurat seldom left the city except to go to the coast or once to exhibit in Holland with the Group X. 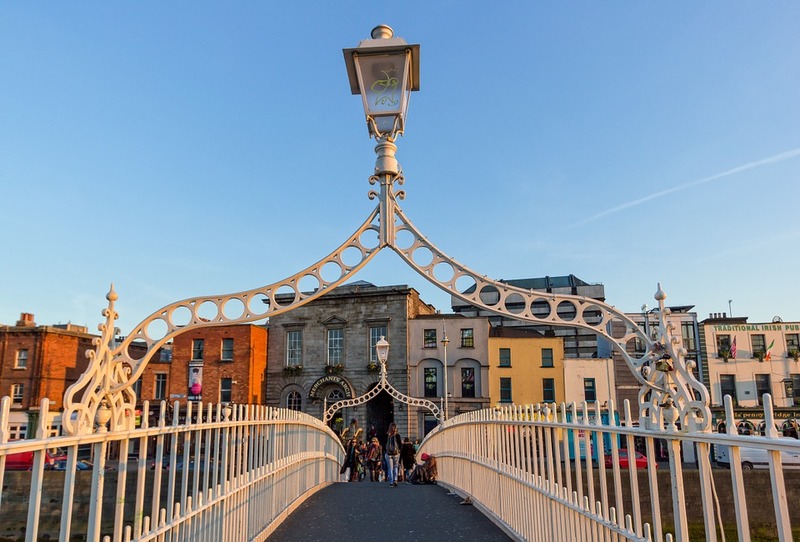 He was a dabber-looking man, always dressed to the hilt with top hat, gloves and such. Degas even dubbed him, "the notary" because of his attire. crowd of unfamiliar faces, he was silent; but with his friends, he would talk endlessly about life and art. He was a master of privacy. It was not until he died that most of his friends and certainly his family found out that he had a mistress, Madeleine Knobloch, a boy named Pierre Georges and another child on the way! 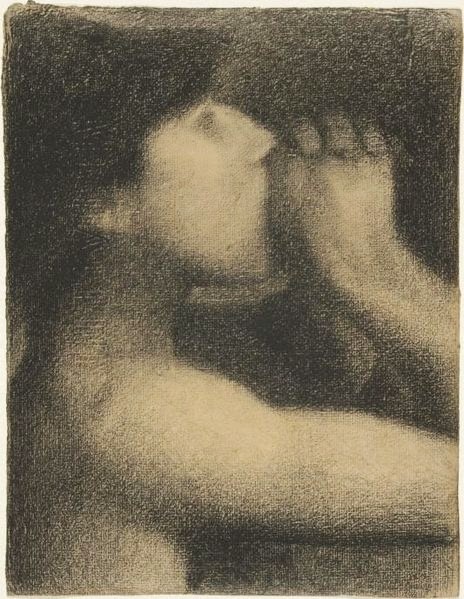 Beyond his style of dress and personality quirks, Seurat was a serious painter. Unlike the Impressionists who created completed paintings en plein air (outside), he produced his work in his studio--working from studies that he created en plein air. 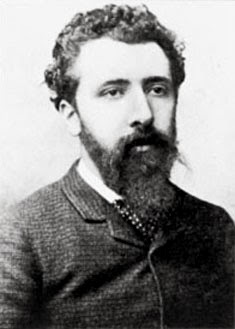 He had been classically trained first at Ecole Municipale de Sculpture et Dessin (school of sculpture and drawing) and then at École des Beaux-Arts. 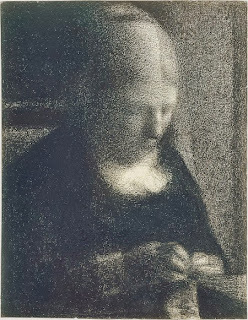 After completing his military service in 1880, he worked for two years on monochromatic drawing, using Conté crayon--a square drawing medium made up of powdered graphite or charcoal with a waxy base. His friend and fellow artist, Paul Signac described Georges Seurat's Conté crayon drawings as "the most beautiful painter's drawings that ever existed." They are certainly incredible and to spend two years working on such a task is daunting in itself. However, what a great way to learn light and shadow, form, composition. And when you don't really have to worry about making a living, it seems easier to learn, experiment and grow. The drawing of his mother shows his great care to save the white of the paper, but also to create the darkest dark. I enjoy how he pours light over her hair and somewhat in the background and her hands. All of this time spend on monochromatic work paid off as he graduated more and more into color. His first major work was Bathers at Asnières. A monumental piece measuring 201 cm × 300 cm (around 6.5 feet by 9 feet), Bathers was completed in his studio from studies, both with Conté crayon and oils. Here is the bather in a tonal study, while the shoreline populated with subjects is in oil. I remember seeing this painting while at the National Gallery in London and was simply dumbfounded. It is enormous. I found myself staring at all the the little pieces as well as the whole. The characters depicted in the painting are of the working class. In the background you can see the smoke stack, representing their industrial lifestyle. 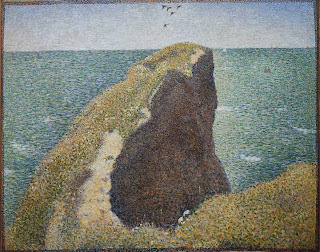 At this point, Seurat is not using his famous pointillism but instead using more impressionistic brush strokes. Of course, the painting was refused by the state run art exhibit, the Salon. So he exhibited in the Société des Artistes Indépendants (the Society of Independent Artists), where there was no jury, nor prizes. The society still exists today. 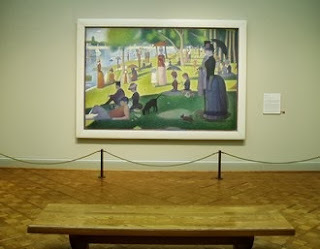 He began his next monumental piece and the one he is most famous for, A Sunday Afternoon on the Island of La Grande Jatte, just after The Bathers and completed it in 1885. He wanted to exhibit the piece with the Independants, but the show was cancelled because of money troubles. 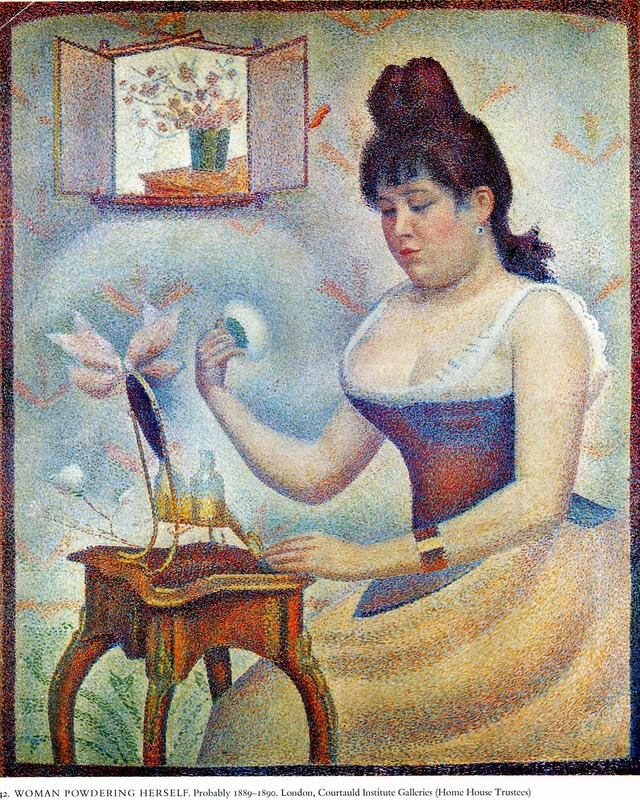 This event was the tipping point of Seurat's painting life. That year he decided to spend some time painting with his friends on the Normandy coast. There he painted 12 oil sketches (he called them croqueton, little sketches) of Bec du Hoc. His first marine landscapes, he ended up using two for larger canvases later. But what was different here than any other time was he started to use his theory of color fusion--instead of mixing colors on the palette, he placed small dots to mix colors on the canvas. There has been so much written about this painting--so many theories, so many opinions. I would like to direct you to a great BBC documentary entitled, Seurat, The Private Life of a Masterpiece. 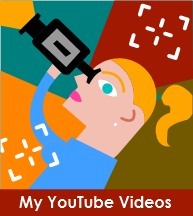 I highly recommend it as the video explains so much of the detail here. Interestingly, the Bathers and Sunday Afternoon seem to have a connection. 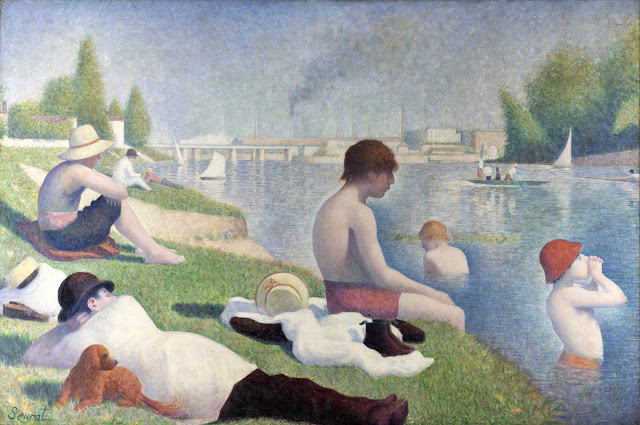 The bathers are on one side of the river,while the bourgeoisie (middle class) are on the other side. If you'll notice in the Bathers, there is land jetting out in the upper right hand corner and a boy shouting. Some say the land represents the other park and the boy is calling out to the other people across the way. 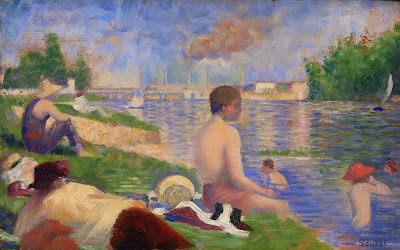 Seurat's Bathers preceded A Sunday Afternoon on the Island of La Grande Jatte, which shows people on the bank of the other side of the river. While the bathers at Asnieres on the left bank are working class people, it is the bourgeoisie who are on the right bank. The bathers are cast in light, while on the Grande Jatte almost everyone is in shadows, and there are allusions to lust (a woman with a monkey on a leash) and prostitution (a woman "fishing"). 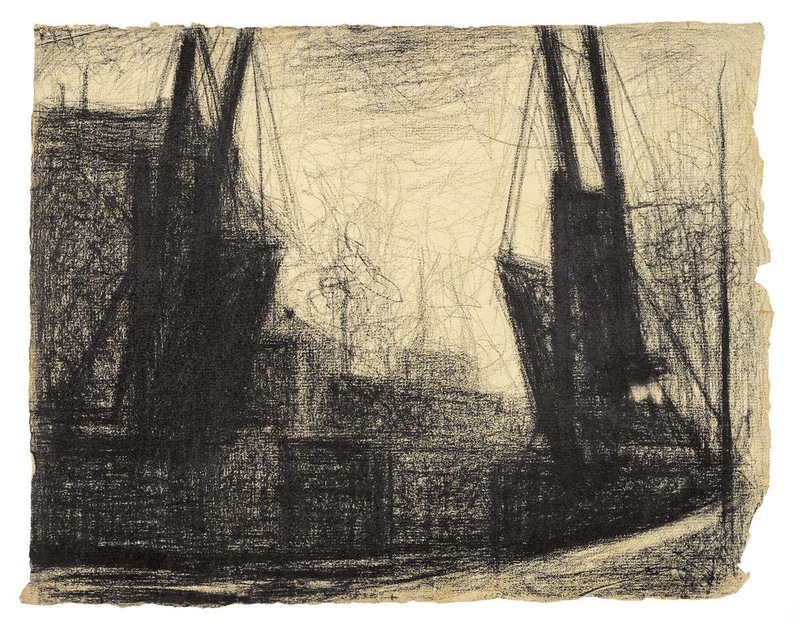 Seurat's message has been interpreted as implying that the working class represented the future, while the middle classes had grown decrepit and ridden with vice. Seen this light and context, the boy who bathes on the other side of the river bank at Asnières appears to be calling out to them, as if to say "we are the future, come and join us". Again, another artist dies way too young. It was 1891 and Seurat was hanging his famous Le Cirque (see right) at the latest exhibition of the Society of Independent Artists. Surprisingly, it was not quite finished, but he was hanging it anyway, no one knows why. That was a Tuesday and he was annoyed by a sore throat. By Thursday the sore throat developed into a massive fever. By the next day he was at his mother's doorstep asking for care with his pregnant mistress and son in hand. Unfortunately, by Sunday, he was dead at 31. He had choked to dead. According to an article I read from the Centers for Disease Control (CDC), Seurat probably had diphtheria and may have survived if he had gone to hospital instead, since they could have done a tracheotomy to clear his airway. Sadly, his infant son dies two weeks later of the same illness.. His son dies two weeks later of the same thing. The CDC believes that perhaps Madeleine was a carrier of diphtheria, but never showed symptoms. Months later, she gives birth, but the child dies closely thereafter. In the end, Madeleine died at the early age of 35 from cirrhosis of the liver. Every time I study an artist for this blog, I think I have met the best and then I meet another and say, Wow! 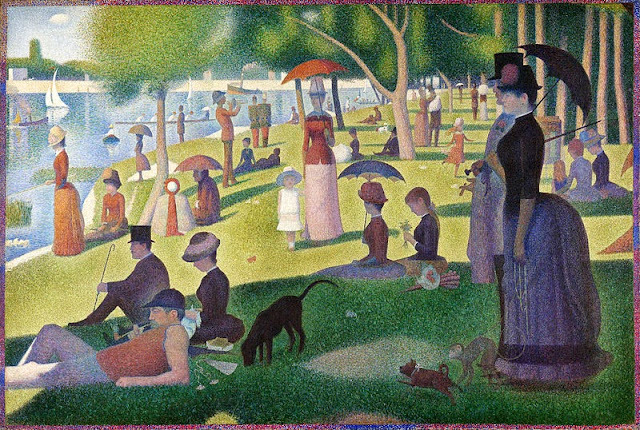 Since I enjoy stippling so much, I feel a bit of kinship with Seurat. I really do enjoy completing an entire drawing with small dots with pen and ink or now colored brush markers. It's actually very soothing, meditative and calming. As with the article on Toulouse-Lautrec, I wish I had more time and space to talk about this artist too. 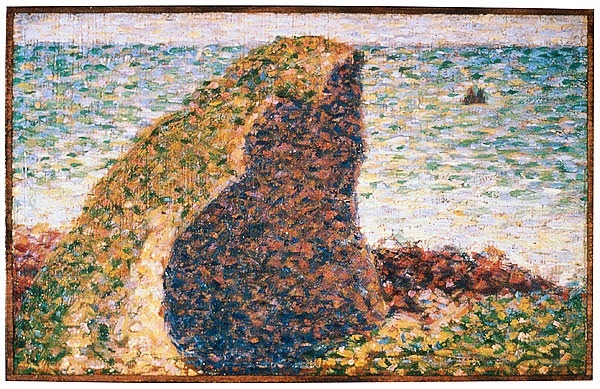 Seurat in his short 10 years of art production, created some of the best works the world has ever seen. His eye and understanding for color is amazing. He also was a master of composition, form and design. His work literally takes my breath away. For fun, you can now find the play, Sunday Afternoon in the Park with George on YouTube. It's a fun play, although not terribly accurate regarding his mistress and child. 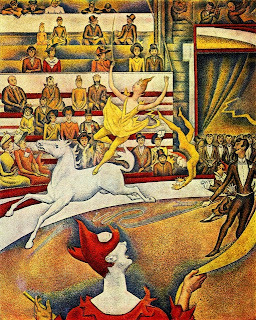 I love how they incorporate his painting throughout the play. Next month, I'd like to conclude this series of articles with an examination of how these post impressionists affected modern art.